I have never been one to make health related new year’s resolutions – but I usually say that reading is one of the things I would like more of in my life. As I was making a list of what I wanted to read in 2016 it was fun to reflect on five books on healing after loss that I’ve found supported my journey. One of the most powerful lessons I learned from my Dad is to be a ‘lifelong learner’, lucky for me I am hardwired for curiosity and self-help, but let’s call it “personal development” it sounds better. Since I’m taking a semester off from teaching at the university I feel like I should be able to cram a little more reading into my world. But I also wanted to share with you some of the books on healing after loss I’ve read that have supported my grief journey. Then I want to hear from you and find out what books you love and have found healing after your loss! Below I have shared ones’s that I’ve read and links so that you can go straight to Amazon and buy them yourself. I have limited this list to all books that are directly related to grief and loss. My next post I will share my favorite books for healing and growth that aren’t grief books. An easy place to start since, if you’ll remember, I shared my interview with this incredible mamma late last year. Love Anna, love the book. It’s just so raw, genuine and real. It’s one of the first moments that I thought, “A-ha, someone gets what it’s truly like to lose a child!”. But, only get this incredible book if you have tissues nearby – You’ve been warned! When the Bough Breaks, by Judith R. Bernstein, Ph.D. This was the first book given to me (about 10 days) after Brandon died…. yeah, it went over real well – NOT! I was an angry Bi!ch in those first months. But, I did read it (like I said, I’m a bit of a self-help addict). It genuinely helped normalize all that I was feeling. The chapters are broken up in a way that you can jump into where ever you are and get some good nuggets. For example, there is a section on mourning and marriage, or different types of death (suicide, overdose, murder, etc). It’s a perfect reference guide with wonderful stories from other bereaved parents! I got to know Nathalie and her work when I hosted the online tele-tummit, “The Healthy Grief Revolution: A Survivors Summit”, in the fall of 2014 when her book was just getting released. Nathalie is a practicing therapist, bereaved Mom and most important – a kind compassionate soul. When I interviewed her for the summit, she shared some incredible tidbits that has helped me better understand how my husband and I are navigating Brandon’s death differently. This is what’ currently next to my reading chair (yes, I have a reading chair, don’t judge me). A friend bought this for me, and had Heather sign it, because she knew it sings my song of the crucial role self-care and mindfulness play in our healing. The book is outlined into an 8-week program so each week you can take baby steps. I love that you could do this every year and see what comes up different in your journal exercises. I hope to interview Heather in 2016 and share more of her wisdom with you! Ok, truth is, I’ve actually never read this book. But I feel like you can’t make a list of books on healing after loss without mentioning it. Although I haven’t read the book I have listened to many interviews with Christina and her message is one of hope and healing – which I believe we need more of in the child loss community. How about you get it, read it and tell me what you think! Or if you’ve already read it comment below and share your favorite take-away lesson. What are you reading on healing after loss? 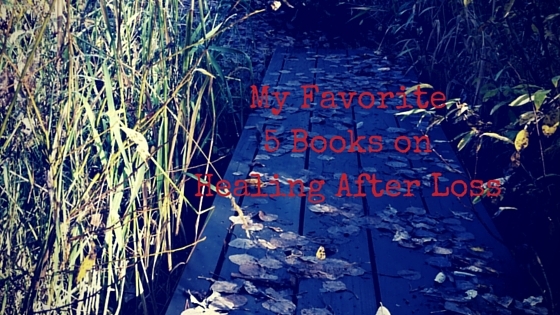 There are so many incredible books out there I bet you have a favorite I didn’t list here. Share your favorite book on healing after loss in the comments below. Or – what’s on your reading list for 2016? Share that in the comments below too!